The year was 1919. The “Great War” was over and the “Roaring Twenties” about to begin. Out in Hollywood Charlie Chaplin, Mary Pickford, Douglas Fairbanks and D. W. Griffith got together to form a new film company they called United Artists. In Georgia, Jackie Roosevelt Robinson was born. In New York, Theodore Roosevelt died. On September 21, at the Ansonia Hotel in New York City, a cabal of Chicago White Sox ballplayers met to plan how to throw the World Series in exchange for gambling kickbacks. On April 10, in Mexico, the revolutionary leader Emiliano Zapata was assassinated, never knowing that one day he would be portrayed on the big screen by one Marlon Brando. And out of Camden, New Jersey, the Victor Talking Machine Company was shipping its latest model Victrolas, an item that had become all the rage for an emerging middle class. For through this wonderful machine music of all types could be piped right into the living room. Everything from Caruso to Al Jolson, from Beethoven to Eddie Cantor was available for purchase on vinyl discs with a hole in the middle. All Victrolas sold in 1919 came with a booklet, a little manual instructing the customer how to get the most from their purchase. 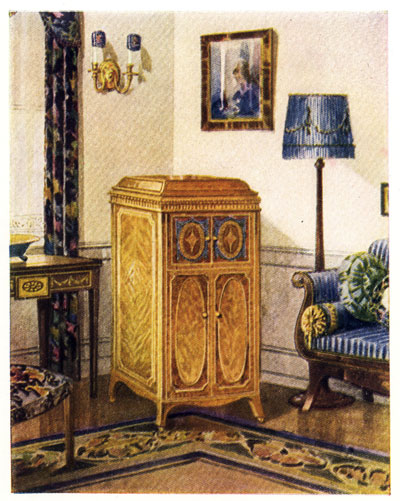 Today, when for the first time you have brought a Victrola into your home, we wish it were possible to show you how much this, the most versatile and so the most satisfying musical instrument in all the world, can be made to entertain, to console and to inspire. To say that the Victrola offers you, your family and your friends “all the music of all the world”—is to dismiss the subject with an entirely inadequate phrase and so this booklet has been prepared to offer certain suggestions for your greater enjoyment of this, your newest and we verily believe your happiest possession. 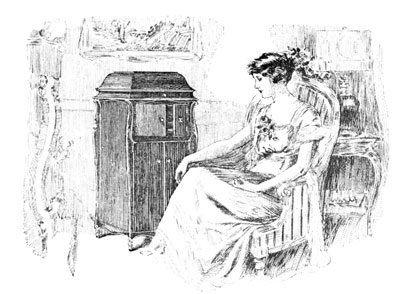 Intimately associated as we are with the development of the Victrola, yet we are fully conscious of the wonder of it and we, no less than our customers, have learned that amid “the daily round of irritating concerns and duties” we have only to turn to the Victrola in order to be once more in love with life and its beautiful, blessed burdens. And yet … there has always been a tension between the “serious” writer and the “commercial” kind. At times the former may think of the latter as a hack. The latter may consider the former a snob. Well, friends, there is room for both caviar and peanuts, pheasant-under-glass and bacon burgers. And culinary delights in between. But I happen to believe that the novels that move us most and heighten our perception of life also entertain on a basic, storytelling level. If I’m not fully invested in the characters, or if the plot is a drag, I’m not prone to sticking around for any message. This doesn’t mean the lead character has to be what we normally call “good.” I root for Richard Stark’s hard-core criminal Parker, because among the other thieves and lowlifes, he has the better argument! My favorite novels have both levels going on. That’s why I love the Harry Bosch series. We are as invested in Harry’s inner journey as in the case he happens to be working on. Even straightforward action thrillers like The Executioner series are elevated when Mac Bolan pauses to reflect on what all this killing is doing to his soul. My favorite endings leave me with a definite feeling. One feeling is “Ah…”, a sense of such satisfaction that I feel all the circles have been completed, the outer plot and the inner journey. Usually the ending scene is a personal one. Examples are Lost Light by Michael Connelly, Nathan’s Run by John Gilstrap, and Eight Million Ways to Die by Lawrence Block. These books have final scenes that move me at the heart level. Stephen King is a master of the “Uh-oh.” As in, something bad is going to happen again! For example Pet Sematary and The Stand. Kris (P.J.) wrote recently about the ambiguous ending. In the right hands, that can have the same effect as combining the “Ah” and the “Uh-oh.” An example is The Catcher in the Rye. That’s a phrase I lift from one of my favorite writers, John D. MacDonald. He’s describing a style that is more than plain-vanilla minimalism, yet not so over-the-top that it screams Look at me! I’m a real writer! The latter is where we get the axiom “Kill your darlings.” You can fall in love too much with a felicitous phrase, though I will say that the axiom is a bit too barbaric for my taste. Sometimes I’ll show mercy to a darling, but always defer to the judgment of my true-life darling and first editor, Mrs. Bell. Give me those things, and you’re liable to turn me from a reader to a fan. And it’s what I hope to give you with each book. So let me put it to you, TKZers. What entertains you? Do you prefer to feast on one kind of fiction? Do you think one type is “better” than any other? Or do you like a big buffet with lots of choices? What do you try to put in your own fiction? This entry was posted in Writing and tagged Dean Koontz, John D. MacDonald, John Gilstrap, Lawrence Block, Michael Connelly, Mickey Spillane, Stephen King, Victrola by James Scott Bell. Bookmark the permalink. A big buffet with lots of choices. I have a question not related to the main issue that I’m wondering if you could answer: I recently saw some early Laurel and Hardy silent films. In one of them a stack of records went crashing to the ground and shattered. Do you know when they stopped using glass for records? A quick google search didn’t help.. The earliest disc records were made of various materials including hard rubber. Around 1895, a shellac-based compound was introduced and became standard, typically composed of about one-third shellac and about two-thirds mineral filler, which meant finely pulverized rock, an admixture of cotton fibers to add tensile strength, carbon black for color, and a very small amount of a lubricant to facilitate mold release during manufacture. 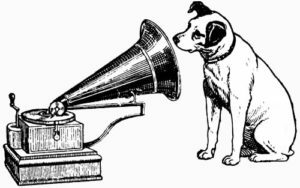 The production of shellac records continued until the end of the 78 rpm format, although other materials were used, including vinyl. Shellac is brittle, and records needed to be handled carefully. Wow! Thank you, Tom, for such a thorough answer. I am an absolute sucker for a novel with a hero or anti-hero I can root for, where the story keeps moving, deepening and twisting, and with conflict within and without. I want narrative drive, and compelling situations with a strong voice. I’ll struggle if the author doesn’t hook me in the first few pages, and make me care about the protagonist. I also love a novel that really engages me emotionally. In my own writing, hit all these bars has been a long time coming. So when my I released my first novel last week (fifth novel written) it was great to see reviews calling it fast-paced, engaging, and nail-biting etc. I have lots to improve on in my own work, starting with getting better at producing what I love to see in books I read, and your wisdom, as always, helps show the way! Dale, that’s great news about the feedback on your new novel. It doesn’t surprise me in the least, as it was “fifth novel written.” You’ve done he work, and it’s paying off. You are entertaining readers … and that’s what makes fans. @Nancy- I love those old movies. Despite the movies, records were never made of glass. In the early 20th century they were made of a polyvinyl/ shellac so they were easy to break but because it was the movies, and a early sound film at that (where any sound made had to be practically yelled) chances are what we saw and heard was sugar glass. Anything with the possibility of being broken – windows, bottles…records was made by the studio of sugar (and water, molded to what they wanted). It was safer than actual glass but shattered like and sounded like real glass when broken. Kim, thanks for adding that bit of knowledge our discussion. Kim, thanks for the interesting information. I also love old films. These were three short silent films–sorry I can’t remember the names–done with a live pianist and, apart from being painfully funny, they were a lesson in building suspense. Laurel and Hardy are heros to root for and the conflict is increased and drawn out until you can hardly take any more. I’m thinking of the scene where they’re hanging from a building under construction 18 floors up. Jim, well said! And very entertaining, with all the conflict, poetry, and deeper meaning. I always wonder where you find all the background material with which you begin your blogs. I like a buffet, and I like to feast, as my midriff well displays. But, seriously, I enjoy the variety. Which reminds me that I very much enjoyed your short story, JOHN WAYNE’S REVENGE. I’ll be waiting for the sequel, in which Hunsacker somehow is resurrected, and takes on the AI software. I continue to follow this blog to raise my awareness (and remind me) of all the things I’ve read on what needs to go into my fiction. I’ve read all your craft books, and would also give a shout-out to your good friend, Donald Maass. His book, WRITING 21ST CENTURY FICTION, is full of good advice on this subject, for both the literary and the genre writer. Thanks, Steve. Hmm…a sequel….you have planted the seed! As for this post, I was alerted to the Victrola booklet via Project Gutenberg. Reading it gave me the idea, and then I just started to think about WHEN it was written … 1919 … and I started doing a little research on that year and came across the material. It just seemed like a fun way to start! And then I did some deeper research on the Victrola, and the Victor company, which I had to share at the end. I write multiple genres, and I read multiple genres. I don’t care so much about the category as I do the writing. Is it a good story? A fresh take? Well-paced? Character-driven? If so, I’m in. If it fails to answer “yes” to those questions, then I’ll probably never finish it. So glad to see you reference Casablanca. My kids make fun of me for watching old movies, but sometimes you just can’t beat them. Casablanca has been one of my favorites since I first watched it in college, and I still (all these years later) watch it several times a year. In fact, it’s on my DVR right now! I still laugh at barney fife, and this vaudeville skit is hilarious. All is art, it’s the staying power that separates. Lead me to the buffet, please. Once I’ve had my fill of books and authors that invite only a first taste, I’ll go back often for those that capture my imagination and teach me something new. I had to leave my entire collection of John D. MacDonald books when I moved across the country. Now I’m rebuilding that library, noticing once again how he builds characters and locations the reader can almost touch. My only real requirements are good writing, a tight plot, and real character motivation. A book with all those will keep me reading far too late into the night. Suzanne, I painstakingly put together a full collection of JDM’s paperback output from The Brass Cupcake (1950) through The Last One Left (1966). Even have copies of the two he NEVER wanted reprinted: Weep for Me (1951) and I Could Go on Singing (1963 novelization of the Judy Garland film). Well said. And I’d add that there’s some well-crafted writing in Mickey Spillane. In his hands, the 1st person POV wove gritty and visually striking yarns that thrilled and entertained millions. Spillane was a much better writer than critics gave him credit for being. Read the first chapter of One Lonely Night sometime. Ayn Rand once wrote an essay explaining why Spillane was such a better stylist than Thomas Wolfe. I agree. Yes! The opening scene delivers inner and outer conflict, a raw, vivid sketch of Manhattan, and a gripping inciting event. What’s not to love? Thanks for another thought provoking and inspiring post. The novels that bring me back for multiple readings tend to build convincing worlds with characters I want to spend time with and understand better. This can be a series (like Patrick O’Brian’s Aubrey/Maturin books) or unrelated stories in a shared world (like Chaim Potok’s novels on the many shapes of Jewish culture). But I suspect that within these the features you highlight are keeping me turning the pages. Two grest examples, Gary. The kind of books that linger long after you have finished. Another good one, Jim. And thanks for straightening out the difference between a Victrola and the famous “his master’s voice” horn. I like stories that entertain and educate me about something. Tom Clancy comes to mind. I read most genres with the exception of fantasy and science fiction. I don’t enjoy either. But I had to respond to this great post because it brought back memories of a special gift given to me by my husband early in our marriage. He worked for an electronic firm and gave me a “stuffed” Nipper. I had the dog for many years until it died a decrepit death. I still have the collar with the Nipper insignia in my junk drawer. It has survived many cleanouts. Nice. I wonder if you can still get one!